It floats up and down and is flexibly moored to wood pilings. The architectural structure consists of aluminum alloy framing insulated with air entrained foam. The solar panel assemblies and armature including wide flange beams are also aluminum as are the door and window systems. 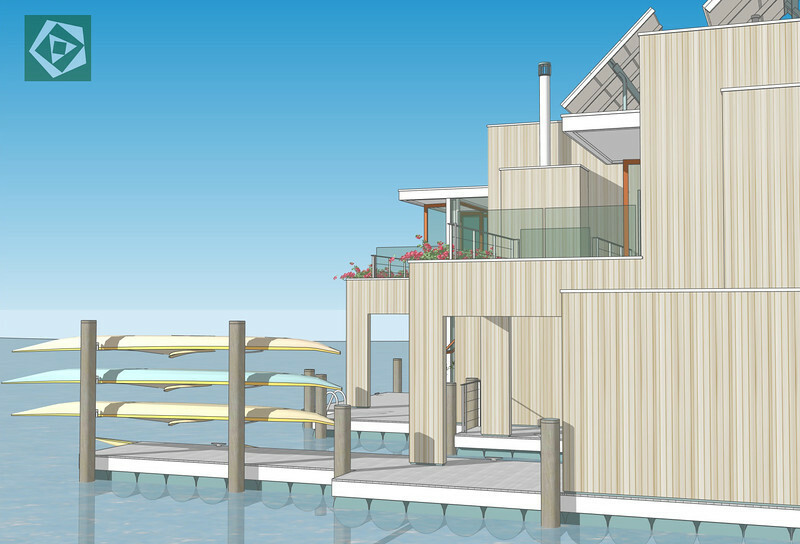 This is a vision based on the joy of living on water and the need to reduce weight and shipping costs. A kitchen, dinning, living space and bath are provided at water level with a sleeping loft above. A bridge connects to a studio space and bath over a boat slip and storage/work space. The studio alternately serves as a guest accommodation or rental space with independent access. Folding doors & windows with retractable insect screens allow interior and exterior space to merge with decks and the environment beyond. Wildlife come to water at dawn and dusk.